Fortress Monroe is too well known to need any description in these pages. It is the most powerful regular fortification on the Continent; and, with its subordinate works is the grim Cerberus guarding the approach by water to our National Capital. It has witnessed the initial movements of many most interesting chapters in the recent war, though itself never within reach of hostile guns, save when the Merrimac made its brief raid upon our fleet in Hampton Roads -- the raid so notably checked by Captain Worden in his little Monitor. Either from it, or past it from Annapolis, had sailed the chief expeditions, marine and military, of the Southern coast. Beneath its ramparts the transports of McClellan's army had made brief rendezvous when hastening to the campaign of the Peninsula; and here again they had to pass, when returning with diminished ranks and soiled plumage to save the National Capital after General Pope's disaster. It witnessed the sailing of Sherman's Port Royal expedition, to which the writer had the honor to belong; the expeditions of Burnside, Butler, Banks, and all the other joint military and naval movements which thundered for three years along the coast, from Cape Hatteras to Sabine Pass. Farragut, Du Pont and Porter stepped ashore on its hospitable beach when returning from their most famous exploits. Of a truth, Fortress Monroe, though not properly in the war, was of the war -- a rendezvous for our greatest naval, military and civil chiefs in some of their greatest moments; nor will its least interesting reminiscence to the future tourist be this which records, that in one of its granite casemates, and looking out through the bars of a grated embrasure on the Empire he had lost, lay for many months in solitary confinement, and awaiting trial, the defeated Chief of the mightiest rebellion which this earth has yet witnessed; or, at least, the vastest in extent and the most formidable in its resources, of which history gives any clear and credible record. And never before, indeed, did the old fort witness such excitement, though partially suppressed and held in check by military discipline and the respect due to a fallen enemy, as on the 19th day of May, 1865, when the propellor William P. Clyde dropped anchor in Hampton Roads, and the news spread on shore -- first in eager, questioning whispers, then in the full assurance of conviction -- that she had on board as prisoners Jefferson Davis, late President of the late Confederacy and his family; Alexander H. Stephens, Vice-President; John H. Reagan, late Postmaster-General; Clement C. Clay, and several more State prisoners belonging to his now scattered and ruined house. "What will they do with him?" "When will they bring him ashore?" "Guess they'll take him right to Washington and hang him by Military Commission?" "Guess you're a jackass; they can't hang him, unless they hang all." "Jackass yourself; the papers say he was partner with the assassins in killing Lincoln." "Who are the other chaps with him?" "Will they keep him in the woman's toggery he had on when caught?" "Guess there's no truth in that." "It's just as true as preaching -- all the papers say so." "They'll hang Clem. Clay sure." This was something of the conversational buzz I had to pass through, while hastening down from my quarters inside the fort, to get an early view of the little steamer, which, with her imprisoned freight, was the centre of attention. For the next three days these speculations continued, colloquially and in the papers; but meantime, and for some days previously, preparations had been going on within the fort, under the direction of Colonel Brewerton of the Engineers, which gave evidence to the inititated that the State prisoners on board the propeller in the offing would soon be transferred -- at least some of them, and for the present -- to securer quarters. Blacksmiths and carpenters were busily at work fitting up casemates number two and four in the first front, and near the postern, for the reception of prisoners. They were being partitioned off into regular cells by busy bricklayers; heavy iron bars were placed across the external embrasures, and windows opening on the interior; and the cells intended for the prisoners were partititoned off into two apartments, that next the embrasure being intended for the captives, while the room or cell opening on the interior of the fort was for his guard. "And it has come to this," was my reflection, as I stood with folded hands first contemplating these arrangements. "But a few months ago, the man for whose reception these preparations are being made, was the acknowledged ruler of many millions of American citizens. He had armies at his command; cabinet officers; a staff of devoted adherents; and ambassadors, though not officially recognised, at all the courts of Europe. Nearly a million of lives -- by battle, disease, and starvation -- have been sacrificed for, and against, the cause of which he was the chosen representative. And it has come to this with him!" Aye, and was soon to come to worse. But this is anticipating. On the morning of the 21st of May some of the minor State prisoners on board the Clyde -- the rebel General Wheeler and his staff -- were placed on board the gunboat Maumee, which then steamed for Fort Warren in Boston harbor; while Alexander H. Stephens, ex-Postmaster Reagan, and some others, were soon after transferred on board the gunboat Tuscarora, which immediately started off to Fort Delaware, as was presumed. Intense excitement, on shore and in the neighboring vessels, accompanied all these changes; but Major-General Halleck, who had come down some days before to superintend the arrangements, would make no sign, and speculation consequently ran higher and higher every moment as to whether the chief prisoner of all was destined to remain at the fort, or be transferred elsewhere in custody without halting. At last, on the afternoon of the 22d, all doubts were set at rest by the arrival of Major-General Miles in a special steamer from Baltimore, this officer being now assigned to the command of the fort, relieving Colonel Roberts; and simultaneously therewith, from the posting of chains of sentinels and guards to keep back the crowd along the Engineer's Landing, and from thence along the route to the Water Battery Postern, it became clear that the important prisoner was about being landed, and that his route would lie in this direction. The parting between Mr. Davis, his wife, four children, and the other members of his family and household who were on board the Clyde, was extremely affecting, as I have been told, by officers who were present -- the ladies sobbing passionately as the chief prisoners -- Messr. Clay and Davis -- were handed over the ship's side and into the boat, which was to convey them, under guard, to their unknown fate. The procession into the fort was simple though momentous, and was under the immediate inspection of Major-General Halleck and the Hon. Charles A. Dana, then Assistant Secretary of War; Colonel Prichard, of the Michigan cavalry, who immediately effected the capture, being the officer in command of the guard from the vessel to the fort. 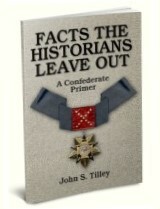 First came Major-General Miles holding the arm of Mr. Davis, who was dressed in a suit of plain Confederate grey, with a grey slouched hat -- always thin, and now looking much wasted and very haggard. Immediately after these came Colonel Prichard accompanying Mr. Clay, with a guard of soldiers in their rear. Thus they passed through files of men in blue from the Engineer's Landing to the Water Battery Postern; and on arriving at the casemate which had been fitted up into cells for their incarceration, Mr. Davis was shown into casemate No. 2 and Clay into No. 4, guards of soldiers being stationed in the cells numbered 1, 3, and 5, upon each side of them. They entered; the heavy doors clanged behind them, and in that clang was rung the final knell of the terrible, but now extinct, rebellion. Here, indeed, is a fall, my countrymen. Another and most striking illustration of the mutability of human greatness. Let me here give a picture of the earliest scene in the cell of Mr. Davis, as related immediately after its occurrence by one who was a passive actor therein, my own connection with Mr. Davis not commencing until two days after (May the 24th), when I was first detailed by Major-General Miles as his attending physician. Being ushered into his inner cell by General Miles, and the two doors leading thereinto from the guard-room being fastened, Mr. Davis, after surveying the premises for some moments, and looking out through the embrasure with such thoughts passing over his lined and expressive face as may be imagined, suddenly seated himself in a chair, placing both hands on his knees, and asked one of the soldiers pacing up and down within his cell this significant question: "Which way does the embrasure face?" Mr. Davis, raising his voice a little, repeated the inquiry. But again dead silence, or only the measured footfalls of the two pacing sentries within, and the fainter echoes of the four without. Addressing the other soldier, as if the first had been deaf and had not heard him, the prisoner again repeated his inquiry. But the second soldier remained silent as the first, a slight twitching of his eyes only imtimating that he had heard the question, but was forbidden to speak. "Well," said Mr. Davis, throwing his hands up and breaking into a bitter laugh, "I wish my men could have been taught your discipline!" and then, rising from his chair, he commenced pacing back and forth before the embrasure, now looking at the silent sentry across the moat, and anon at the two silently pacing soldiers who were his companions in the casemate. What caused his bitter laugh -- for even in his best days his temper was of the saturnine and atrabilious type, seldom capable of being moved beyond his smile? Was he thinking of those days under President Pierce, in which on his approach the cannon of the fortress thundered their hoarse salute to the all-powerful Secretary of War, the fort's gates leaping open, its soldiers presenting arms, and the whole place under his command? Or those later days under Mr. Buchanan when, as the most powerful member of the Military Committee of the Senate, similar honors were paid on his arrival at every national work -- even during those final moments when he was plotting "to secure peace" by placing in command of all our forts and armories, such officers as he thought might be relied upon to "go with the South if the worst came"? And was not his question significant: -- "Which way does this embrasure face? Was it north, south, east, or west? In the hurry and agitation of being conducted in, he had lost his reckoning of the compass, though well acquainted with the localities; and his first question was in effect: "Does my vision in its reach go southward to the empire I have lost, or North to the loyal enemies who have subdued my people?" 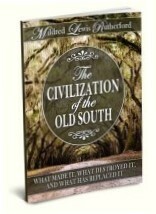 -- for it is always as "his people" that Mr. Davis refers to the Southern States. His sole reading-matter a Bible and prayer-book, his only companions those two silent guards, and his only food the ordinary rations of bread and beef served out to the soldiers of the garrison -- thus passed the first day and night of the ex-President's confinement. This article was extracted from John J. Craven, The Prison Life of Jefferson Davis (New York: Carleton Publisher, 1866). 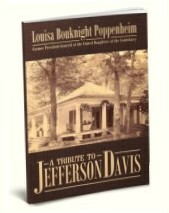 Click HERE to order this book.